At long last, Illinois has tossed its old method of funding schools in exchange for a formula that aims to send more state money to the poorer districts that need it most. Despite having called a previous incarnation of the plan a “bailout” for Chicago Public Schools, Gov. 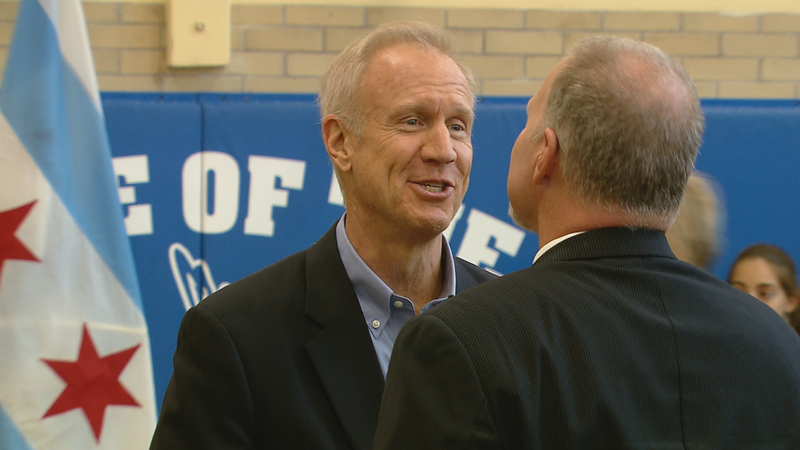 Bruce Rauner chose CPS’s Ebinger Elementary School in Edison Park to sign Senate Bill 1947 into law. The measure gives CPS an estimated $450 million—$150 more than the measure he’d vetoed, Senate Bill 1. While Republicans joined with Democrats to pass the package in large part because of the school choice component, that’s also what pushed other lawmakers to vote no on the measure. It has also attracted the most scrutiny – scrutiny that was never given a true public airing via the regular legislative process: The 550-page bill was filed Monday morning, passed both chambers of the General Assembly by Tuesday evening and on Thursday afternoon was signed into law. Critics, including the vocal Chicago Teachers Union, say it’s a vouchers program in disguise; a scam, benefitting wealthy donors to the detriment of public education. CTU is contemplating a lawsuit challenging the tax scholarship program. A spokesman says the union’s lawyers are contemplating constitutional and civil rights issues, and well as a clause in the measure which ties the scholarship program to its copious other changes, meaning that if one provision of the bill is killed off in court the rest would likely die with it. Supporters, including Cardinal Blase Cupich of the Archdiocese of Chicago, hail it as a means of helping kids from low-income families to access the same private schools as children who grow up in wealthier households. “The most important decision a parent makes about their children is where they’re going to go to school,” Cupich said Thursday. Cupich was an instrumental broker in bringing battling politicians toward compromise, and says that by educating some 150,000 students statewide, Catholic schools are saving Illinois approximately $2 billion a year. The Illinois State Board of Education says it will begin to process the paperwork needed for schools to receive their delayed General State Aid, which should have gone out Aug. 10 and 20 but was delayed because the budget made aid contingent on passing of a new evidence-based funding formula. ISBE Superintendent Tony Smith said in a statement that schools should expect to receive that money within a week. What Will Tax Credit Scholarships Mean for Illinois? Aug. 30: What role should the state have in private school education? A look at Illinois’ plan and how other states run the controversial program. Aug. 29: The Illinois Senate has passed a new education funding measure that Gov. Bruce Rauner said he will sign into law. Aug. 24: After days of meetings and months of debate, an agreement has been reached on a new education funding reform in Springfield.